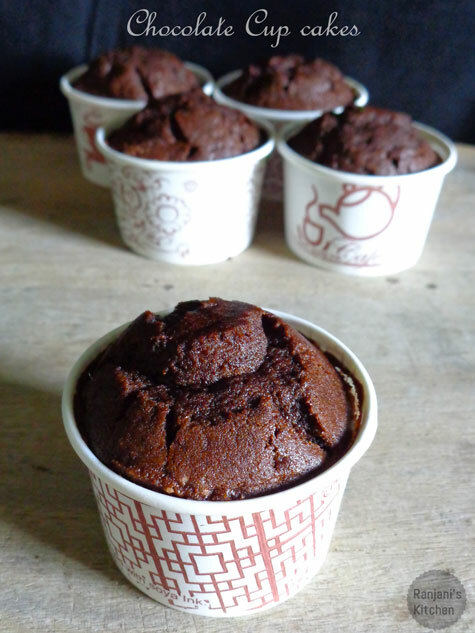 Chocolate Cupcakes– who will not fall in love with cocoa flavored muffins.This easy cupcake recipes at home take lesser time to prepare. 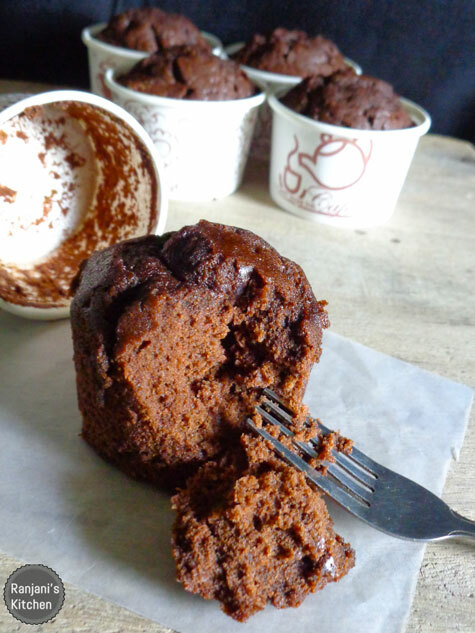 Cupcakes, you can make using liners or paper cups. 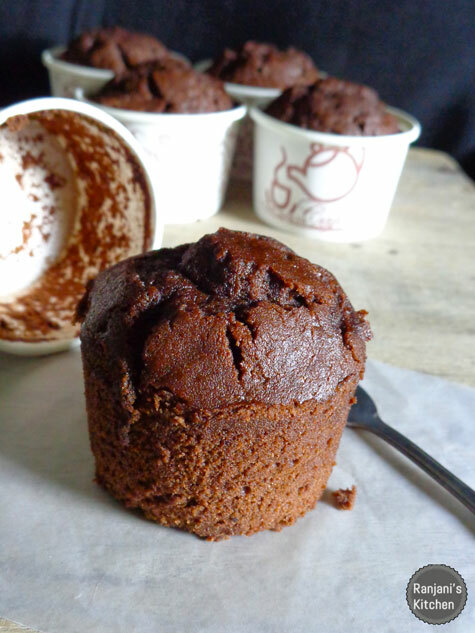 In paper cups, no greasing or muffin tray needed. Fill in 2/3rd portion, arrange in plates and bake it. It’s really an easy method anyone can make a try. 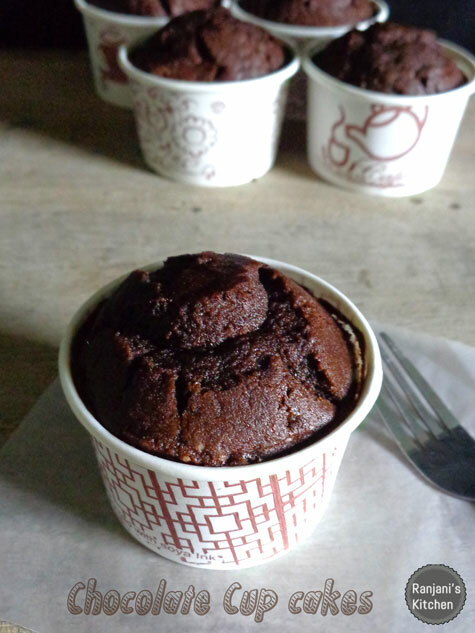 I fell after seeing these appealing Chocolate cupcakes in Joy Of baking.Her blog is always undemanding to follow baking. Trust me, this is one trouble-free cake to try and irresistible too. Pre-heat oven for 10 mins at 180 degrees. Boil water, add cocoa powder and Mix well without any lumps. Sieve All purpose flour, baking powder and salt together and keep aside. Beat Egg for few mins to frothy level in a separate bowl. In a wide bowl, add butter, sugar and vanilla essence. Beat well-using whisk or electric beater to a creamy consistency. Now add Cocoa mixture and beaten egg to the mixture. Again whisk for 2 to 3 mins to incorporate all. Add half portion of flour mixture and fold using spatula or whisk. Do not overbeat it. Add the remaining flour mixture and fold it. Take paper cups or muffin liner in greased muffin tray. Pour 2/3rd portion of batter in it. Arrange the paper cups in crust plate. Place it in a preheated oven, bake for 18 to 20 mins. Remove from oven, check the centre portion using a tooth pick or fork to test whether the muffins are baked well. Cool for 15 mins and remove from muffin tray if you used muffin liners. Serve as it is or frosted with icing cream or whipping cream. Use baking tray if you want to use muffin liners instead of paper cups.Grease the tray with oil or butter, and place the liners in it. Do not overbeat after adding flour mix to wet ingredients.Just fold to combine the ingredients. Pour 2/3rd level of batter in cups. perfectly made!! Looks so soft and moist!! Wow! Easy recipe and the cupcakes look delicious! Thanks for sharing 🙂 Will try this soon. Delicious chocolate cupcakes very nice recipe. Those cupcakes look terrific! A fabulous recipe. Looks yummy and temping !! !